I have been painting a lot of studies the past few weeks. I am pushing my skill level again. It is always a challenge often fraught with frustration and the appearance of little progress. Perhaps artistic growth follows a different timeline. It definitely isn't a straight line! I have two works in progress. One was at Short Sands. It was a beautiful afternoon. We have been fortunate to have many of these this winter, if you can call it that. While Eastern U.S. has been hammered with snow and wind, we have had mild days with little rain and much sunshine. It is as if the storms back East have sucked all the water from the west and dumped it, in the form of snow, on the storm weary people and animals there. I woke up this morning with emails announcing not only a gale warning but heavy rains. I figured I had better get out today before the storm arrives. I just made it. The tide was hitting low when I arrived. It is always surprising how little time the tide takes to come back in. 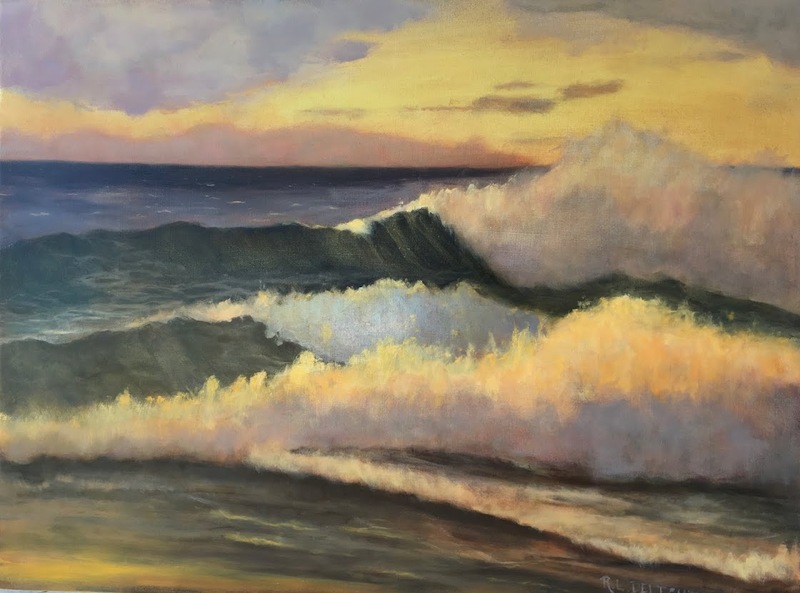 When I left, the waves were coming within a foot or two of my easel. This is another work in progress. I got enough that I will be able to finish this study from memory in the studio. The day was not sunny but the gray filtered light was bright. It was not hazy though. One of the things I love about gray days are the amazing colors that pop out in the sea. This study still needs work to capture what I was seeing. I put the waves in last so they were done in haste. The wind was picking up as I was leaving the beach. I had heard the eagles behind me but suddenly one swooped right above my head and landed up the beach a bit. The crows always follow or chase the eagles. This one had a nice tidbit it was eating and as I stood there watching, it finished it off and cleaned its beak in the sand. I did take pictures but the exposure on my cell phone camera went haywire and they did not come out. I always enjoy watching our local Bald Eagles. Such a treat, and a nice ending to the day. I have big changes happening in my studio which involves a clearing out and re-arranging. It is always a good thing to do as one learns and grows. I really like 'Mood Change'-I mean even more than I usually like your work ! I wish I could share your posts but my browser rarely lets me have a picture from them and I know links just get lost when people are scrolling down . Thank you Rukshanaafia! I appreciate your wish to share and completely understand. Thanks for the lovely comment!